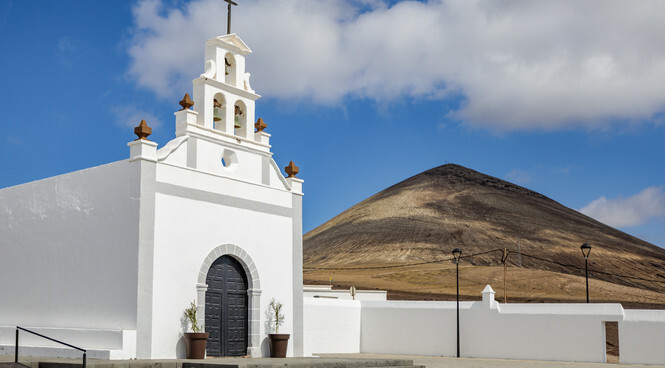 Overlooking lively Puerto del Carmen, Tias is Lanzarote’s second largest town is a great choice for a relaxing villa holiday thanks to its laid-back vibe. Dotted with 16th century architecture and hosting many folklore festivals, Tias is not short of Spanish cultural attractions. Of course, you always have the option of heading into Puerto del Carmen for an even greater choice of shops, bars, restaurants and fantastic sandy beaches. 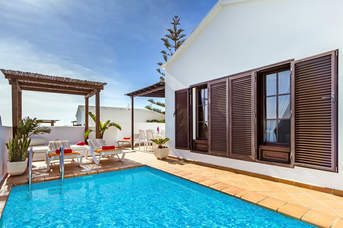 There is an 18-hole golf course in between Tias and Puerto del Carmen surrounded by volcanic views – a great place to spend your stay.Overlooking lively Puerto del Carmen, Tias is Lanzarote’s second largest town is a great choice for a relaxing villa holiday thanks to its laid-back vibe. Dotted with 16th century architecture and hosting many folklore festivals, Tias is not short of Spanish cultural attractions. Of course, you always have the option of heading into Puerto del Carmen for an even greater choice of shops, bars, restaurants and fantastic sandy beaches. There is an 18-hole golf course in between Tias and Puerto del Carmen surrounded by volcanic views – a great place to spend your stay. Tias is well equipped with plenty of shopping facilities able to cater for all your holiday needs. There is a large supermarket, a winery, butcher’s shop and bakery, perfect for picking up some sweet treats. Head into Puerto del Carmen for more choice with many small independent stores as well as souvenir shops selling knick-knacks and trinkets. For a wider choice of shops, Biosfera Shopping Centre is just 10 minutes' drive away with 5 floors of shops and fashion outlets. You won’t run out of restaurants within Tias as you’ll find plenty of restaurants serving local dishes such as tapas, as well as, international cuisine. The marina in Puerto del Carmen has some of the best seafood restaurants on the island, and if that doesn’t tickle your fancy then the resort itself has plenty of restaurants sure to suit everyone’s taste. Biosfera Shopping Centre has plenty of restaurants, as well as an outdoor cinema. The nearby Lanzarote Golf Resort has a bar and restaurant which is open to non-members. Along the coast of Puerto del Carmen is Playa Grande Beach. A long sandy beach with plenty of water sports on offer as well as sun beds and parasols for hire. Just along the coast is the smaller cove, Playa Chica, next to Puerto del Carmen Old Town. With an abundance of marine life, this beach is great for diving and snorkelling. Various water sports are also on offer at this beach and hammocks and sunbeds can be rented. For those looking for even more excitement, Playa Pocillos Beach is also nearby sandy beach, great for windsurfing and kiting. Tias is a great family resort with plenty of children friendly activities. Spend the day in nearby Puerto del Carmen at Rancho Texas Theme Park, a zoo with plenty of exotic animals and a water park perfect for cooling off. By night, this theme park turns into a Texas themed evening with dancing and a BBQ. Engage in some friendly competition at the mini golf course or go-karting track in Puerto del Carmen. 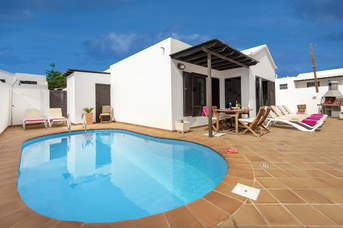 If one Canary Island is not enough then take a trip to neighbouring Fuerteventura. Don’t miss out on a visit to Timanfaya National Park, a spectacular volcanic landscape that you can take a tour around. Spend a day here and stop off at the El Diablo restaurant where you can have your lunch cooked using geothermal heat. Another volcanic attraction is the Cueva de los Verdes Caves, intricate volcanic tunnels formed thousands of years ago. Take a guided tour around these natural works of art and learn about their natural and cultural history.